The Bushnell Pro 350 lumen flashlight has several nice features. The Bushnell Pro Series flashlights have features desirable for on-duty or off-duty use. Bushnell is most famous for rifle scopes, optics, binoculars and spotting scopes. However, in recent years they have joined their competition in expanding their product lines to include the accessories most often used by their customers. For Bushnell, this has included tactical flashlights, bore scopes, range finders, trail cameras and even GPS units. Bushnell is owned by Vista Outdoors; which includes popular names like Hoppe’s, Uncle Mike’s, and Blackhawk. Recently, I purchased a Bushnell Pro 350 lumen flashlight from a large retailer. My decision was based upon several reasons. First, I wanted a flashlight with a decent light output that was actually less than my other patrol lights (500-800 lumens). Second, the price was right! At only around $30 (retail) I would be spending much less then most competitive lights. The new Nightstick TWM lights offer 350 or 850 lumens with an optional strobe feature. Nightstick has announced their new TWM (Tactical Weapon Mounted) series of weapon mounted lights. These new lights come with the option of 350 lumens or 850 lumens in power, with an additional strobe option for either selection. The Nightstick TWM lights appear to be well-made, featuring very respectable industry features for flashlights designed for shooting and harsh conditions. Nightstick is a brand under Bayco Products, Inc., which has been providing law enforcement, first responder, and utility lights for over 30 years. Having handled and worked with Nightstick products in the past I can attest they are quality lights that should provide excellent service. The Valkyrie PL-1 II fits nicely on Glock pistols. Olight of Europe has just released their new Valkyrie PL-1 IIpistol-mounted light. 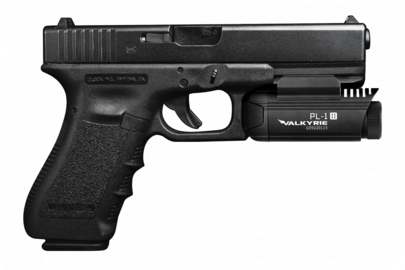 The Valkyrie PL-1 II comes with several features to make it a real contender when choosing a weapon mounted light. Designed for Picatinny rail attachment, the Valkyrie PL-1 II has a quick attach and quick detach locking lever for ease of use. Producing 450 lumens of light in a relatively concentrated beam gives the Valkyrie more than enough intensity to illuminate and blind targets, while not being too bright to cause significant flash back concerns for the user. Plus the light has a very cool name. 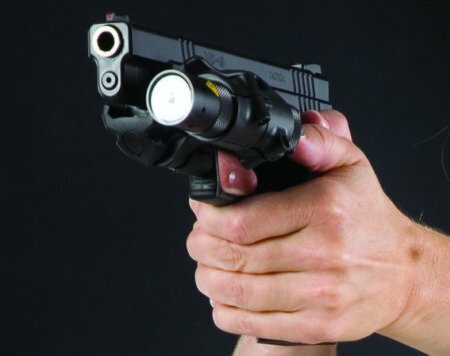 The Safariland RLS is a unique pistol-mounted light option. Safariland continues to expand its ever-impressive line of firearm-related accessories, with the new RLS – Rapid Light System. 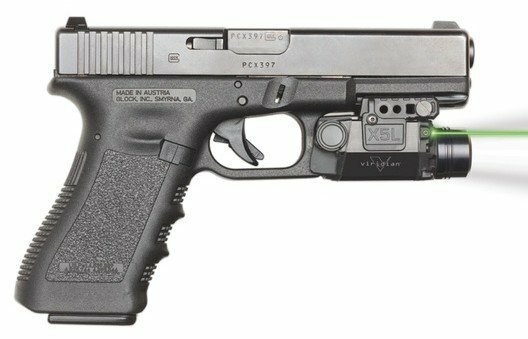 Designed specifically to be attached to pistols with a rail system on the front of the pistol’s frame, the RLS is both versatile and practical. The Safariland RLS provides an off-set mounting system that swings left or right depending on the shooter’s preference. The RLS is designed to be used with a tail-cap push-button on/off switch light, or the optional pressure switch activation system. Once the RLS is swung to the left or right, the shooter can use their off-hand thumb to activate the tail-cap on/off button on the selected light for proper illumination. The Fenix TK09 flashlight is one of the company’s targeted flashlights for law enforcement users. Having a maximum light output of 900 lumens, and coming with four different lighting options, the nicely compact TK09 could be an ideal duty or back-up flashlight. The size of the TK09 is roughly the same as the Surefire G2X or Streamlight Poly-Tac or Scorpion lights. Fenix has been producing flashlights for quite some time, but until recently their primary focus was on outdoors activities. Their lighting products have been very popular in biking, hiking, and camping communities. 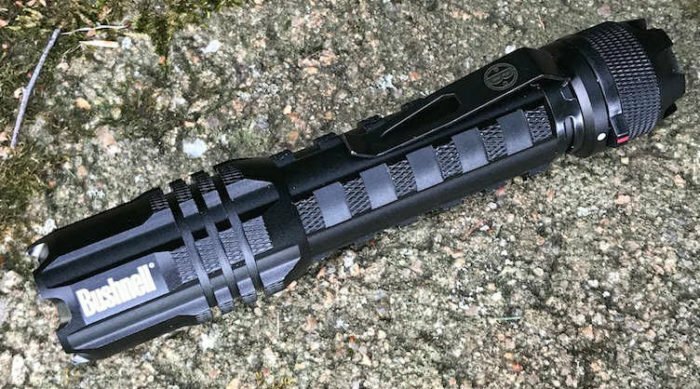 In the last few years Fenix has been making a concerted effort to enter the law enforcement flashlight market, and their products are well worth consideration. I’ve handled several Fenix flashlights at SHOT Show and was impressed with each one. Celestron is more known for outdoor lights, but has products LE can use too. Celestron is the optical division of Valor Electronics, and originally focused on founder Tom Johnson’s interests in astronomy. Johnson brought observatory-grade optics to the masses, while streamlining the manufacturing process. Since its founding in the 1960’s Celestron has continued to be a market leader, creating dozens of revolutionary new products including telescopes, sport optics, and microscopes. Recently Celestron has introduced the production of their Elements ThermoTorch 5 and ThermoTorch 10 flashlights. These new flashlights combine high quality material manufacturing and LED performance, with creative features for those who live and work in the outdoors. Streamlight has recently announced improvements to their Portable Scene Light. Previously the Portable Scene Light was capable of 3600 lumens, but the new improvements have expanded the light capacity to an amazing 5300 lumens. The Streamlight Portable Scene Light provides an impressive amount of light for a variety of law enforcement scene purposes. Unlike other scene lighting systems, the Streamlight Portable Scene Light is relatively light-weight and compact, and can be deployed in less than 30 seconds. Streamlight produces some of the best hand-held flashlights available on the market. Their flashlights are some of the most trusted products law enforcement officers have to choose from. I have used several Streamlight products in my career and have found each to be very well made, durable, and long-lasting. The new LAPG Recon C1 flashlight. LA Police Gear recently announced a new line of flashlights under their own label (LAPG). The Recon C1 flashlight is one of the new arrivals, and when I saw the light on their website I was really impressed by the specifications and features. Flashlight technology has exploded over the last 10-15 years, and the new Recon C1 appears to be a beneficiary of those improvements. Boasting a maximum output of 850 lumens, with (4) lighting options, and on sale from LAPG for only $39.99 the Recon C1 appears to be an amazing light! LA Police Gear has been a law enforcement retailer for nearly 20 years. Started by a former southern California police officer and SWAT cop, LA Police Gear has grown to a company selling over 20,000 products, from many of today’s most popular brands, covering a full spectrum of law enforcement needs. If you’ve never checked them out it would be worth your time to do so. Streamlight® Inc. has been one of the most familiar names in law enforcement illumination for decades. This year Streamlight has just announced the release of the UltraStinger® LED patrol flashlight. The UltraStinger features the latest in high-powered LED technology, providing an amazingly bright 1,100 lumens and 65,000 candela in a long-distance beam. A Glock with the Viridian X5L green laser/light combination mounted. The Viridian X-Series pistol laser light combines a bright Cree LED light, with the aiming advantage of a Viridian green laser sight. Green lasers have a distinct advantage over more common red lasers because the brightness level of the laser allows a clear targeting point even during daylight, where most red lasers tend to suffer. Though not as popular in law enforcement use, laser sighting systems have become very popular for U.S. military ground units in the recent wars in Afghanistan and Iraq.